“The best part of waking up…”, my mantra after another not so blissful nights sleep. While YES, it is without a doubt the coffee that gets me up and going that I love and cherish so very much, but this morning, a little nook and little cranny had me wiggling my toes with excitement as I pulled back my sleepy warm covers to attend to a little one waking far too early for the bedtime he chose the previous evening. That’s right. You heard it. 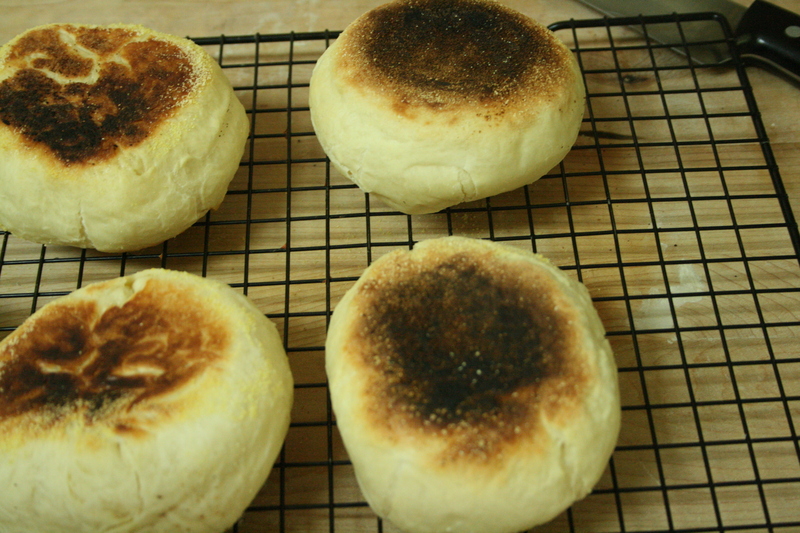 English Muffins. Oh me, oh my. 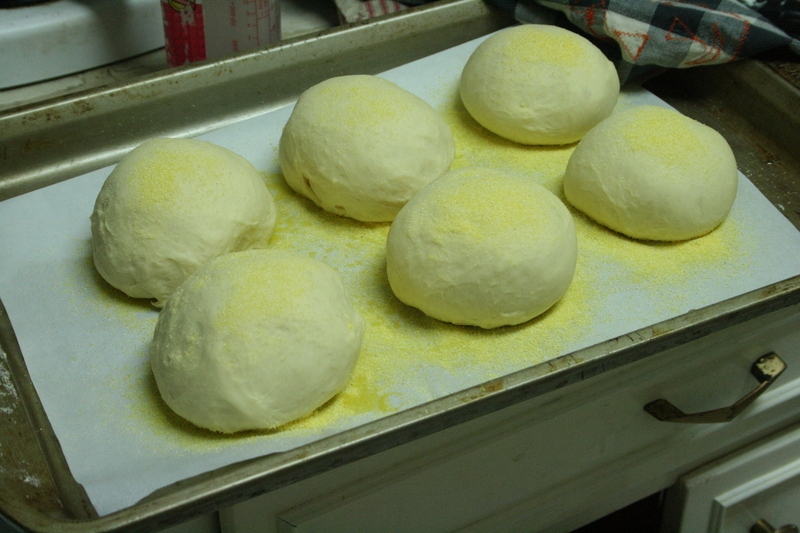 These little balls of dough happened to be the pertiest of doughs I had made in say…. at least six weeks! Oh how I love me a satiny-soft white dough. They are surely some of the most glorious substances on this planet. 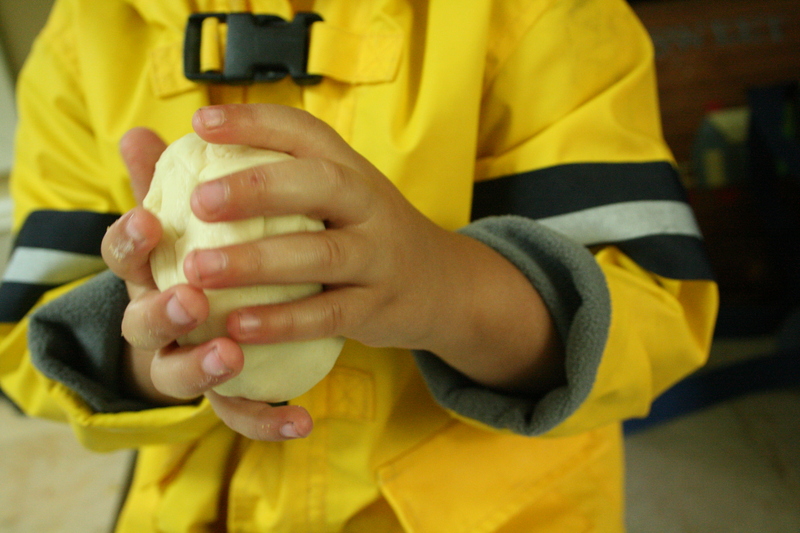 Making the english muffin isn’t as difficult as old Mr. Thomas would have you believe. And here is a secret: you can do it better than him too. I promise. Start off with your fancy sifter and load it up with 2.25 cups of unbleached bread flour, 1/2 tablespoon of sugar, 3/4 tsp of salt and 1 1/4 tsp of instant yeast. In another bowl mix up one tablespoon of butter and 3/4 cup of milk. Oh, this looks weird! The butter is all waterproof but soggy at the same time. I don’t understand it either. 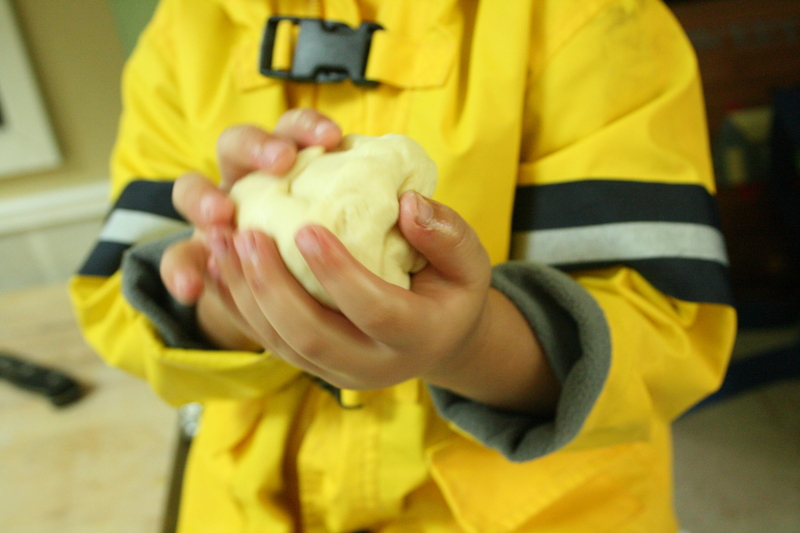 Start mixing the two together until you have a ball of dough. If you need to you can add up to 1.4 cup more of milk. Now on a floured surface beat it up good and proper. Knock it around a bit. This should take a while if you are not practiced at it. It needs to pass the window pane test. Pop her in an oiled bowl, turn it once and let it rise for about 90 minutes or so. Wipe the counter down and slice into 6 equal pieces. Form each into a little ball. 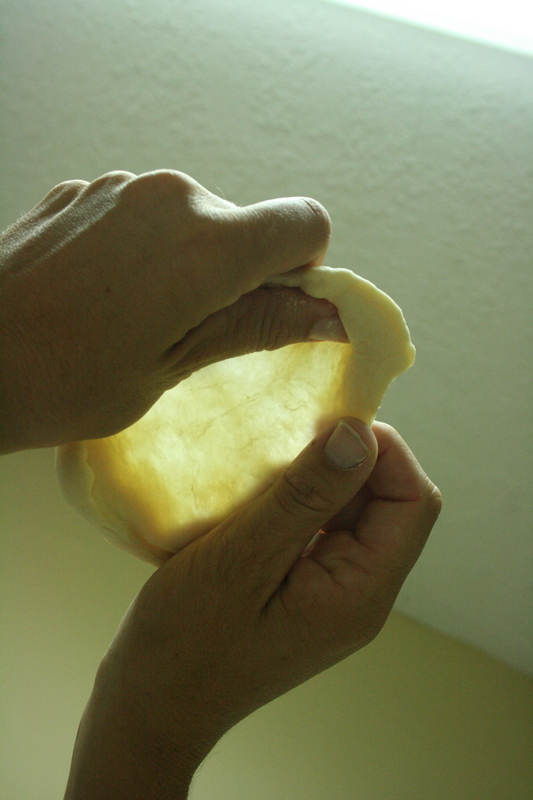 Then, taking one piece at a time, pull back the dough over and over on the top until it forms a very tight ball. Tuck the bottoms under nice and neat and place on a sheet tray lined with parchment. Spray them all with olive oil or water and sprinkle with cornmeal. 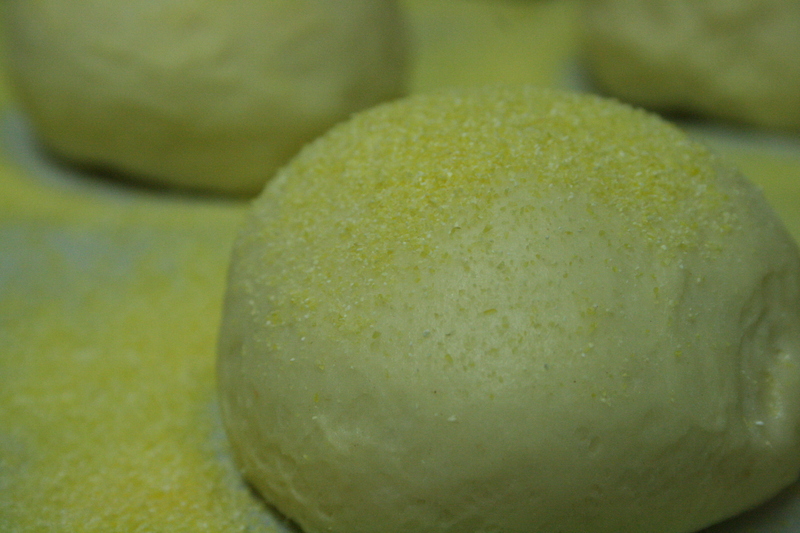 Cover with a towel and let rise for another 90 minutes. Heat up a big old skillet with a brush of olive oil (which surprisingly enough fixes squeaky doors! Who knew?) to a medium temperature and cook them biscuits on each side for about 5 minutes. While you are sizzling the first batch, cover the remaining ones back up so they don’t get all hard. Place all the golden brown muffins in a 350 degree oven for 8 minutes. Let them rest for a good thirty minutes before you dive in. This is a must, for they are still finishing their cook time. Oh yes, the simple things in life are what keep this here mama going. A warm, soft, buttered, english muffin on a crispy eye monday morning is just the thing to keep me grinning for many hours to come. And of course a slightly bottomless mug of joe. That doesn’t hurt either. OOh yes, and these taste divine with a spread of marscapone. Like most things tend to do. Hope the start of your week is a little bit tasty too. 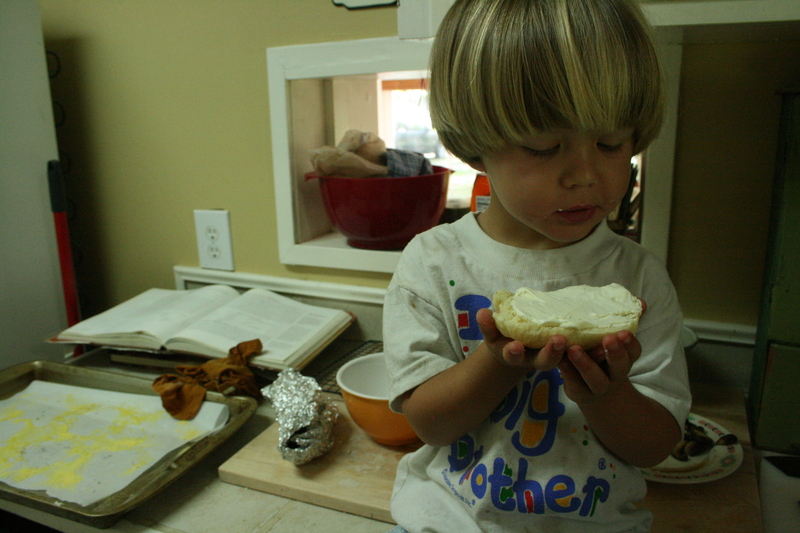 This entry was posted in the year of bread and tagged baking, bread, english muffins, parenting, recipe, sleepless nights, year of bread. Bookmark the permalink.